Jomtien Complex. This 32 storey condominium is the perfect choice for those wanting to live right by Jomtien Beach, walking distance to restaurants, shops, bars, taxi routes, etc. No motorbike needed if you live here. The condo also has a large communal swimming pool. Recreation and tennis courts, 24-hour security guards with CCTV as well. This Room is on the 21st floor, its 68 sqm and has Amazing sea views. 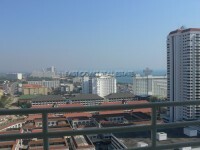 Its a very stylishly designed studio, one bathroom, Euro-style kitchen, A/C and Fully-furnished. Just brings your suitcase!.